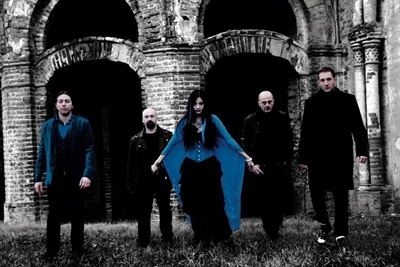 The Italian band, Evenoire, has been on Sonic Cathedral’s watch-list ever since the release of their 2008 self-released EP, I will stay. In the intervening years, the band has found a home with the fine folks at Scarlet Records, honed their craft, and taken their time in weaving together stories and legends to create their full-length debut, Vitriol. It is hard to fit Evenoire neatly into just one genre. Certainly, there are plenty of symphonic elements, but also progressive, folk and Medieval, along with dashes of the Far East. 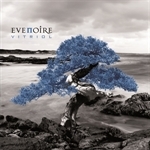 Whatever genre one chooses to label Evenoire’s music, it is good stuff! 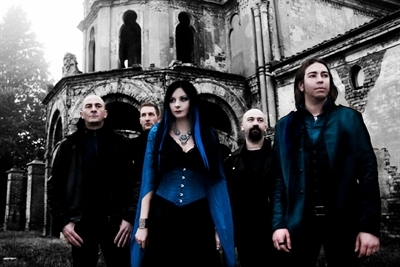 Sonic Cathedral’s Robin Stryker caught up with vocalist, Elisa “Lisy” Stefanoni during a sun-drenched weekend get-away to chat about Vitriol, alchemy, Italian folklore, collaborating with Gaby Koss (Nota Profana, ex-Haggard), and much more. Dive in to learn more! Robin: Hello, Lisy, and welcome to Sonic Cathedral webzine! Thank you for carving out time from your weekend getaway to talk with us today. Would you start off by introducing us to Evenoire’s new album, Vitriol? 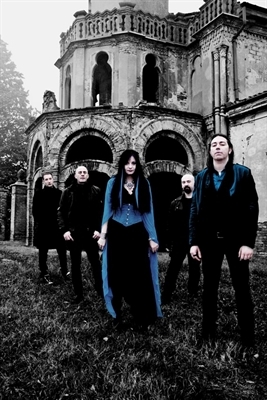 Lisy: We recorded the album between March and May 2011 in Munich, Germany at Dreamsound Studios with Mario Lochert (ex-Visions of Atlantis, Emergency Gate) and Jan Vacik (Dreamscape). V.I.T.R.I.O.L. (Visita Interiora Terrae Rectificando Invenies Occultum Lapidem) is an acronym from the alchemical literature that means a deep travel into ourselves, in order to discover a deeper dimension, and the element is water. In fact, water and alchemy are the main themes of the lyrics, which are about legends, literature, and Italian history. Usually, when we compose, Marco (the bass player) composes all the music, I write vocal and flute melodies, and all together we arrange the songs. About lyrics, I like so much to travel. When I travel, I look for legends about the places I visit, and I use them for lyrics. So, Vitriol is a journey -- a journey into ourselves -- but also into Italian folklore. About the music, I can say that it’s not just gothic metal, but we also have symphonic keyboards and Medieval melodies. We try to put together different influences from gothic to symphonic, from prog to Medieval, and also Oriental melodies. We try to be original in this way. Okay? (laughs) And everything come in a natural way, we don’t force the writing process trying to play this or that genre of metal. All our influences are left free to emerge. Robin: Please tell us about some of the legends and folklore in Vitriol’s songs. Lisy: I’ll explain you some legends. For example, “Girl By The Lake” is about a legend from Iseo Lake … it’s a lake in the North of Italy … and it talks about a girl and a lost love, and how this girl killed herself just to reach that love. Another song like “Minstrel Of Dolomites” talks about how a lake of the mountains Dolomites was born, and it’s about the famous poet and composer Oswald von Wolkenstein. Other legends? Hmmmm … ah, yes! “Days Of The Blackbird,” the single that we have on the web now, is about a legend in Cremona (Cremona is our town): the last three days of January are called “The three days of the blackbird.” They are the coldest days of the year, and the lyrics explain one of the legends that originated this kind of folklore. It talks about a young couple who had to marry and reach the small town to the other side of the Po River. They crossed the icy river on foot, it was the end of January. After some days of celebration they had to come back home, but this time the ice broke and they died, and during the next three days a blackbird cried to call the attention of the people. We have not just legends, but (for example) “Misleading Paradise” is inspired by an epic Italian poem called Jerusalem Delivered (La Gerusalemme liberata) by Torquato Tasso, a famous Italian poet, and it talks about the garden of the sorceress Armida, a kind of golden age where she trapped the Christian soldier Rinaldo during the First Crusade. “Wise King” is about the meeting between the Queen of Sheba and King Solomon. So we don’t talk about everyday life. We like so much to look for legends and particular stories. Robin: In your travels, are you drawn to places with water? And what locations inspire you the most? Lisy: Yes, I really love waterscapes, in particular lakes! In fact, I travel often to lakes, and I love to discover small mountain lakes. I like them so much, together with rivers, waterfalls and also the sea. I like so much, for example, to visit Garda Lake: it’s a lake in the north of Italy, not far from Cremona. I go there, look at the water, and think about lyrics or musical melodies. Waterscapes inspire me so much! Robin: You told us about the story behind “Misleading Paradise,” which is your duet with Gaby Koss of Nota Profana and formerly of Haggard. How did the two of you start working together? Lisy: I’m honest … I met her on Facebook. She listened to our music, and she like it so much. We started to talk to each other -- to talk about music and our lives -- and we found a really good harmony. So when I discovered that Gaby is from Munich, I immediately asked her to collaborate with us, and she really was willing because she liked our sound, our melodies. We met on the web, but then we were lucky because we recorded in Munich, and she is from Munich! Gaby is really a lovely and sweet woman, and I think she has a really great voice. So it was a wonderful collaboration for us! Robin: Would you tell us a bit about your own musical background? I believe your original instrument was the flute, rather than your voice. Lisy: Yes, I started to study music at the age of six, because my father is also a musician. He talked to me about music since when I was a child, and he made me love music so much. So I started at the age of six with the flute, and then I also attended some piano and guitar courses. At the age of 15, I guess, I really found my strong passion for singing. I started with modern singing: first with soul/pop music and then with rock, also playing in some cover bands and acoustic project. Then I studied for about five years opera and classical singing. So it’s a passion that my father gave to me, the music. 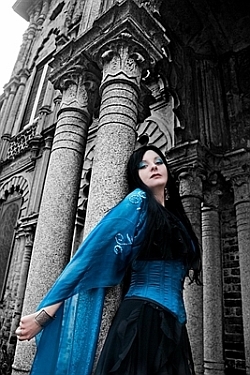 Robin: Since opera was my introduction to metal, I am always curious about classically trained metal vocalists. Which opera composer do you think would have been in a metal band, if he lived today? Robin: Which is your favorite Puccini opera? Lisy: Oh my God, hmmmmm … Turandot! Robin: Did you ever consider pursuing something other than music? Lisy: Yes, I studied at university history of art, and I really would like also to work in the art world. I really would like to open an art gallery, or maybe work in a museum, or organize cultural events. My mother is an artist (she is a painter). My father gave me the passion for music, and my mother gave me the passion for art. So if I am not a musician, I would like to work in the arts. Robin: That makes perfect sense! In your Eve’s Apple bio, there is a question regarding what advice you would give yourself at the beginning of your musical career, and one of your bits of advice was: “Be careful with the people that promise to help you in easy and unclear ways.” What did you have in mind with that piece of advice? Lisy: You know, when you are a girl, it’s really easy to meet in music someone who promises to help you just because you’re a girl, and also tries to claim “something else” from you. So I think that girls have to be really careful with people that try to help them, because not everyone is professional. Not just this, but also someone maybe promises this and this, but they are not true. (laughs) So, be careful in this way because you are a girl in a world made of guys in metal, and also because someone may promise you something that is not true, maybe just to earn money from you. I also met someone that was in this way. Robin: So, it was the voice of experience? Lisy: Yes! Not really directly on myself, but I saw something like that in the past. Robin: With Vitriol’s release date only a few days away, what does it feel like right now, waiting for the album to actually be released? Lisy: We started together in 2006, and we took time to find the right harmony to compose and write our own music. We promoted our band a lot during these years releasing the self-produced EP I will stay and playing many concerts here in Italy, and now it is great to have our debut album in our hands. It’s like a DREAM, and I’m really happy about that. But you know, it’s really a long wait for a band, especially in a country like Italy because we have not many places where we can play, and metal music is not a kind of music you can find on TV or radios. But when we started to record in Munich, we believed in this dream a lot and we were sure to find a good label like Scarlet Records! Robin: Do you get nervous when new reviews come in for Vitriol? Lisy: No, I’m not nervous. I really like to read the reviews because I like to know how other people receive, understand and feel our music, our songs. I think that every writer can give you something. We see our music in a certain way because it’s our music, but it’s great to read how other people can see our music. So for me, it’s interesting to read the reviews. I’m not nervous, no. At the moment, I saw a lot of beautiful reviews, so I’m really happy because webzines and magazines like so much Vitriol. Robin: Doctor T at Sonic Cathedral gave Vitriol a perfect 10/10 in his review. Lisy, we have about reached the end of our time together. What would you like to tell your fans? Lisy: I want to say that “I thank you so much” to all the people who have believed in us since the beginning. I hope one day to play in the States, and I’m also very thankful to Sonic Cathedral and all the people from the States who follow us and like our music. I’m really thankful to you too Robin, for giving me the opportunity to have an interview on Sonic Cathedral. Sonic Cathedral is the best website about female voices in metal, and I’m really proud to introduce you Vitriol. (laughs) So yes, thank you to all! Robin: Thank you so much, Lisy! I hope you have a beautiful, sunny rest of your weekend, and wish you and your mates in Evenoire a very successful album launch.